Most major on-line hotel providers will display over one hundred results for places to stay in Niagara Falls. When in fact they include just about every hotel within a thirty mile radius. To make your life easier we display only hotels within the city limits. We’ve also left out a few properties that have consistently poor reputations. Remember too that if it’s not listed on our “Fallsview Hotels” page then it does not offer a view of the falls. 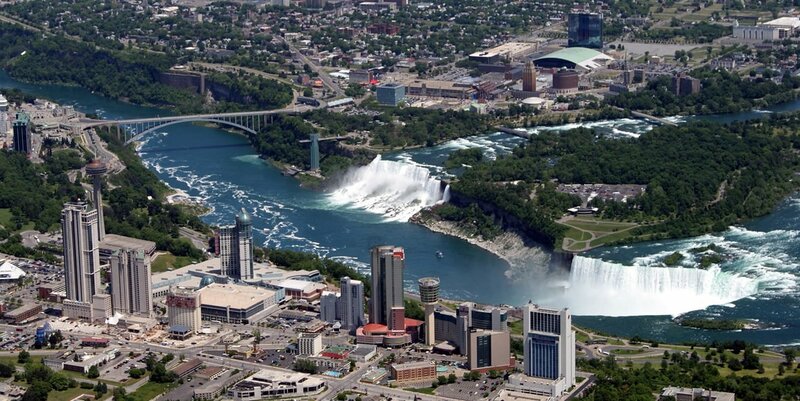 ALL FALLSVIEW HOTELS ARE LOCATED IN NIAGARA FALLS CANADA. The photo below displays the USA on the top of the image. Before you reserve your hotel room please look over our hotel and attractions map below. The map displays all the hotels which we consider to be within a comfortable walking distance to the falls. To give you some perspective on walking distances it is 1.6 kilometers or 1 mile from the Rainbow Bridge to Table Rock in Niagara Falls Canada. Parking is very limited on the Canadian side and there is no parking near the center of Queen Victoria Park. On the US side it’s almost 3/4 miles or 1 Kilometer from the Seneca Casino to the brink of the American Falls at Prospect Point Park. If you are not staying in close proximity to the park you have several options. Find out if your hotel offers a shuttle to the Falls or you can park at one of the city/provincially owned overpriced parking lots. Most hotels offer shuttle service to the park area yet we’ve read many story’s about people waiting and waiting for their particular hotel’s shuttle. There is also park owned transportation which make a circuitous route to the attractions and hotels. In Canada you may have to change busses to get from your particular hotel to the park. So bring some good walking shoes! Most hotels in Niagara Falls Canada charge for parking, so be sure to find this out when making reservations. There is a change in elevation between the area of Victoria Avenue and Fallsview Boulevard to the Falls on the Canadian side of Niagara. You actually walk downhill to reach the park. There is no easy access from the hotels nearest the Canadian Falls unless you take a shuttle or the seasonally operated incline railway ($2 .50 +tax each way). The major attractions in Queen Victoria Park are the park itself for viewing the Falls, Boat Ride Below the Falls and Table Rock visitor center. If you are not up for a lot of walking be sure to check if your hotel offers free shuttle service. Especially at the end of the day when it’s uphill to get back to your hotel! Main access to the park is by sidewalks located along Clifton Hill and Murray Street. In New York access is from the Robert Moses Parkway. Many hotels close to the Falls sell out during July and August so it’s best to book your room as far in advance as possible. There are many other hotels in the outlying areas which have rooms available during peak tourist season. Just don’t expect a low rate if you drive up and think you are going to get a good price for a room. Many hotels raise their rates exorbitantly during peak season. We’ve seen flea bag motels charging upwards of $200.00 per night. Every Fallsview hotel on this website has a direct feed to each hotels in house reservation system for the lowest possible rate. Always check to see if all taxes are included with your stay- often the 3% destination & marketing fees are not included. Frequently asked questions we receive. Q: Are there any Fallsview Hotels that offer outdoor balconies? A: The Sheraton on the Falls is one of two Fallsview Hotels that offers balconies with a view of Niagara Falls. The suites that do have balconies are all located on the south west corner of the hotel. Be sure to look closely at the room types to make absolutely sure you are reserving a suite with a balcony. Many of their rooms are advertised as having balconies yet they only have a narrow door that opens to the outside yet you cannot actually sit outside. The Crowne Plaza also has a very limited number of balcony suites and again, be sure to double check to make sure you are getting the room type you desire. Q: Will hotel rates go down as my travel dates get closer ? A: It’s just the opposite. As hotels get closer to full occupancy for a given date they will raise their rates. It’s best to book early for the prime tourist season months of June, July and August. Q: When will my credit card be charged ? Q: What happens after I submit all the information for a reservation ? A: You are purchasing the room for a specific date. Upon completion of your reservation you will be provided with a confirmation number. Please write this number down! It will be necessary for correspondence with the hotel to confirm, change or cancel your reservation. Many hotels have a restriction where you must cancel more than 48 hours in advance to avoid a cancellation fee. If you do not cancel outside this 48 hour window expect to be charged the full amount for your stay. Q: What if I need to confirm, change or cancel my reservation ? A: Contact the hotel directly by phone or e-mail. Be sure to write down your confirmation number! Q: I’ve heard about bed bugs in Niagara falls hotels. Is this true? A: This is a serious claim to make about a hotel so we contacted the Ontario ministry of health to find out more information. It turns out that there have been confirmed cases even at higher end hotels. We have a high percentage of travelers from Asian countries that have been known to occasionally carry these critters on their luggage. After speaking with a number of reputable hotel managers they indicate whenever there is suspicion of bed bugs the rooms are inspected and treated immediately. We believe no hotel owner wants a reputation for this type of problem and that they correct it as soon as possible. If you are suspicious we recommend you place your luggage in the bathtub upon arrival and inspect the seams of the mattress as this is where they are usually found. 99.999 percent of the time you will find nothing but it doesn’t hurt to check! Q: How much should I expect to spend for tips? A: The normal amounts for tipping are as follows: Valets-$2.00-$3.00 when dropping off or picking up your car. Bellhops-$5.00 plus one dollar for each bag. Doorman for hailing a taxi-$1.00. Housekeeping- $2.00-$3.00 per nights stay. Wait staff-15-20% of bill. Tips at restaurants is very dependent on the quality of service & food. Tour guides usually receive 20% of the cost of the tour. This is for a very good tour guide. Please ignore the signs in tour busses stating “20% tips appreciated” We think this is in poor taste. These are guidelines only. Leave a tip which you feel is adequate for the level of service you receive. Q: Is it safe to book online through this website and how do your prices compare with others? A: We have processed thousands of reservations during the past twenty years without a single security lapse. Most of our hotel reservation links are direct with the hotel for the lowest possible rate. Please visit our “editors top ten hotel picks” for additional information. And… All fireplaces in the hotel rooms are fake!